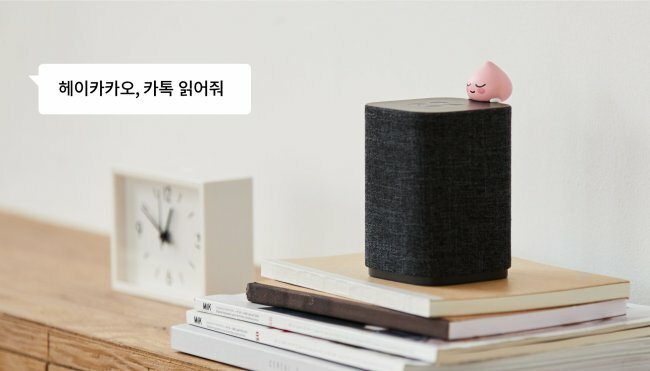 Kakao’s smart speaker Kakao Mini can now read out loud KakaoTalk messages sent to your phone -- a feature that users have long been calling for. Kakao said Tuesday that Kakao Mini has been updated to include the new function. Users can go to the settings on the Kakao Mini configuration app to activate the feature. The new function is made available through a combination of natural language processing and voice recognition engines developed by Kakao, the company said. Messages from one-on-one chatrooms and both group chatrooms can be read aloud. In addition to reading out loud KakaoTalk messages, users can also simply say “reply” to send a response to a chatroom right away. To protect privacy, users are alerted via KakaoTalk when the message reading function is activated. Moreover, users also have the option of setting a verbal passcode that can act as a password before messages are read aloud. The KakaoTalk message read-aloud feature is also being incorporated into the company’s mobile navigation app Kakao Navi this month, in a move that could help ensure safety on roads, the company said. The message-reading function will be adopted into Hyundai and Kia vehicles equipped with Kakao I, the company’s proprietary AI engine, within next year as well, according to Kakao. Kakao Mini is among the most popular AI speakers in Korea, where several similar products are competing for market share, including the KT’s GiGa Genie, SK Telecom’s Nugu and Google’s Google Home. As of now, Kakao Mini is the only speaker that is compatible with KakaoTalk, the most widely used mobile messenger in Korea.